Area: 788 sq km.Location: The Marble Range itself is much larger than the <a href=ArxPg.asp?ArxId=2675>Marble Range Provincial Park</a>. For example, it includes areas south of Pavilion and also encompasses Clinton. The Marble Range is notable for its series of folded limestone ridges and castellated peaks along a NW-trending axis, 35km long and 15km wide. Includes: Edge Hills, Marble Canyon (north walls), Chimney Rock, Wild Horse Ridge, Lime Ridge. Terrain: Similar to the Clear Range to the south, this is a region of limestone peaks with wooded valleys, grassy valley bottoms, and alpine ridges. Peaks are mostly gentle, some have steep sections offering scrambling. Karst landforms are common. The Marble Range Provincial Park protects much of this infrequently visited area. Colin Campbell describes the area: "Considered a subunit of the Fraser Plateau, the Marble Range geologically is part of the Marble Canyon Formation which extends...from Spences Bridge to Jesmond...The highest peaks are at the northern end where the more arid climate renders the limestone more resistant [less susceptible] to weathering...Hiking trails, where they exist, are fairly primitive. Once you find your way up, however, you are looking at some of the best ridge hiking in the Cariboo" [source : Trails of the Southern Cariboo, C. Campbell, 1998. Pub: Rocky Mountain Books]. The area, due to aridity and karst landforms, has very little surface water. Once snow melts, there is no other source of water, and parties entering the range after late spring should be prepared to carry enough water from the trailhead to supply all their needs, especially if planning to camp. The range is the northern extent of the Marble Canyon Formation, a limestone belt extending from the Cornwall Hills in Upper Hat Creek to 65km NNW of Marble Canyon. The formation is a stratigraphic layer ~200m in depth in the encompassing Cache Creek Group that ranges from 400 to 2000m in depth. The Marble Canyon Formation represents the Permian Period in the Cache Creek Group. 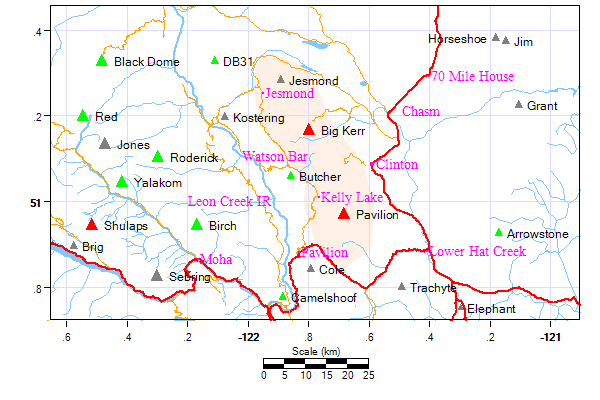 The Cache Creek Group ranges in age from the Carboniferous (360mya) to Middle Mesozoic (150mya). Limestone is often formed in tropical reefs. In the Pacific "ring of fire" that means typically near volcanic islands. Fossil paleontologists determined the limestone of the Marble Canyon Formation is formed from fusulinid foraminifers, a single-celled animal secreting a calcium carbonate shell. The limestone matches rocks of South East Asia and the Pacific Rim. The fossils are dated to the Permian period in the late Paleozoic Era, 230mya. Quarry operations in the Marble Range have also identified the fossilised remains of crinoids- primitive marine invertebrates with delicate, feathery arms that flourished 300mya. It is theorized that the Marble Canyon formation was a volcanic island that was transported by plate tectonics over hundreds of million years from the tropics to its present high latitude location. Collision with adjacent plates caused extensive folding of the limestone into major NNW-trending anticlines that form the high ridges of the Marble Range. The folding is complicated by faulting and smaller scale folding. Between the anticlines, overlying sequences of argillaceous sediments (clay-like), chert (silification of limestone) and volcanics of possibly Jurassic age survive in the intervening synclines.